There is vast confusion among workers in determining whether they are entitled to overtime pay and meal and rest periods. The IRS and Department of Labor identify lengthy factored tests for workers and employers to evaluate their entitlement and; respectively, legal obligations, however, these factors are weighted depending on the type of employer and the facts of the worker’s circumstances. As a result, the factors are often subjective when applied, and result in failed understandings of entitlements, making it difficult for those without legal expertise to appropriately evaluate and determine if they are protected under the California Labor Code, and if so, which provisions they are subject to. There are two ways in which employees are misclassified, the first and most common is workers who are misclassified as “exempt” from the overtime and meal/rest period requirements set forth in the California Labor Code. 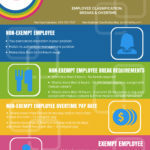 If you are an “exempt” employee you have no entitlement to overtime or meal/rest periods. In consideration of the factors identified by the Department of Labor, the most salient factors to determine your status are whether or not you exercise discretion in your work and whether or not you supervise any employees. If the answer is “no” to these questions, you are likely a non-exempt worker and entitled to protections under the Labor Code. Many workers mistakenly believe that if they receive a “salary” versus hourly pay (punching a time clock), they are “exempt employees” and therefore have no entitlement to overtime compensation or meal and rest periods. On the contrary, whether one is paid salary or hourly is not determinative of your entitlement. Salary is a manner of payment for a specified period of time and does not govern the entitlement to overtime or meal and rest periods. Rather, a worker who is paid a “salary” may be exempt (not entitled to overtime or meal/rest) or non-exempt (entitled to overtime and meal/rest). 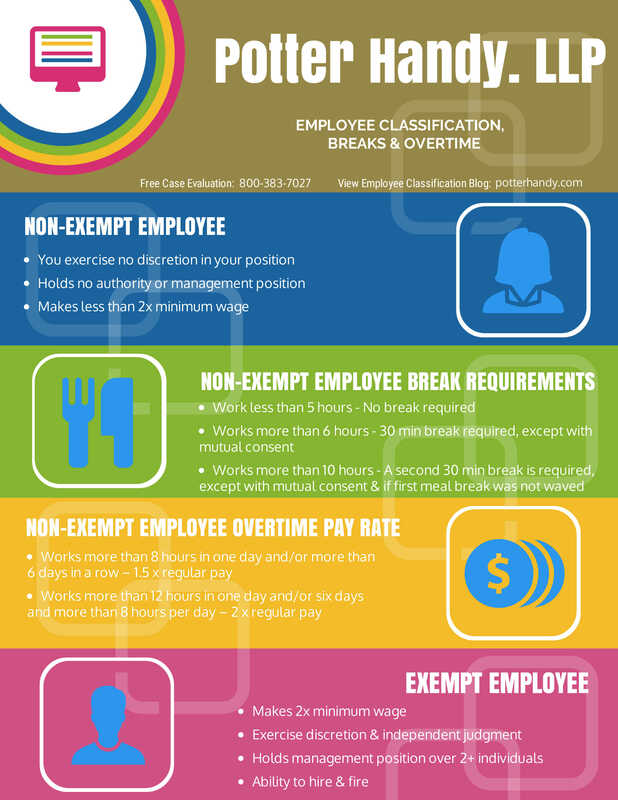 If an employee is non-exempt, overtime pay is calculated based on total wages broken down to an hourly rate of pay for a 40 hour work week. For example, a worker making $40,000 per year in salary, would have an hourly pay rate of $20.00 per hour. The rate for overtime to pay paid beyond 8 hours per day is time and one-half, or in this example, $30.00 per hour. A worker who works more than 12 hours per day is entitled to double time for all hours worked beyond 12 hours—under our example, $40.00 per hour. Similarly, a non-exempt employee would be entitled to be compensated for meal and rest periods if they are not provided. The California Supreme Court in Brinker Restaurant Corp. v. Sup.Ct., 53 Cal.4th 1004 (2012), held that employers are not required to make employees take meal and rest periods, but rather must simply make them available. Employers have three choices for employees working at least 5 hours in a day, (1) afford an off-duty meal period; (2) obtain consent to a mutual waiver if the shift is no more than 6 hours; or (3) obtain a written agreement to an on-duty meal period if circumstances permit. If employees are discouraged or prevented from taking meal and rest periods, they are to be otherwise compensated for one hour of pay as a penalty. If you are being prevented from taking meal and rest periods and not otherwise compensated, the employer may have violated the California Labor Code. The second type of misclassification involves whether the worker is to be paid as an independent contractor and therefore not entitled to overtime, meal/rest, or any protections under the California Labor Code; versus whether you are an “employee’” and entitled to Labor Code protections. Like the discussion on exempt/non-exempt, the analysis of whether a worker is an independent contractor or an employee is equally confusing, notwithstanding the lengthy list of factors identified by the IRS to determine status. An easy indication of you are entitled to protection under the Labor Code is receipt of a W-2 tax form at the conclusion of the tax year. If you are a W-2 employee you receive full protection under the Labor Code, and if non-exempt you are specifically entitled to overtime compensation and meal/rest periods. Unfortunately, if you receive a 1099 tax form from the employer at the conclusion of the tax year, it is not determinative of whether you are an independent contractor. Like the factors set forth by the Department of Labor in determining whether or not an employee is exempt or non-exempt, the factors are weighted and are based on the facts of the employment. The primary factor for determining independent contractor status is whether your employer has “control” over your work and schedule, which includes supervision. Other commonly applicable factors are whether you are free to work for others, whether you use the tools and instrumentalities of the employer, whether you report to work at the employers’ offices versus a separate office or at home; and whether you are required to follow the employees policies and procedures. As a 1099 employee, you are responsible for your own withholdings and the employer does not pay a “payroll tax” or undertake any of the tax burdens for your work. If you do not withhold funds for payment of your income tax, you may be facing a large tax bill, and reduced entitlement to unemployment and disability benefits. For this reason, intentional misclassification of workers as independent contractors instead of employees has a significant impact on your entitlement to Labor Code protections, and can results in an unfair business practice creating both unfair competition and deprivation of public tax dollars, all to the benefit of the employer, while shifting the entire tax burden on the worker. Misclassification of independent contractor status has become so prevalent, that the California legislature enacted Labor Code § 226.8, which severely penalizes employers who intentionally misclassify employees with fines up to $25,000. This provision has been referred to as the “Business Killer Act,” by employers who are subject to it, contending that this penalty is excessive and will prevent them from doing business. Since misclassification of workers as independent contractors often results in huge savings for employers, often far in excess of the penalties, the “Act” should be referred to as the “Business Equalization Act.” For the first time in California history, employers are being held to as standard that ensures they will think twice before intentionally misclassifying employees to avoid payroll taxes. The answer for employers subject to this provision is…DO NOT MISCLASSIFY YOUR EMPLOYEES AND YOU WILL NOT HAVE TO WORRY ABOUT THE PENALTY. Employment laws are extremely complex. If you feel your employee rights have been violated contact an employment law attorney at Potter Handy, LLP. We will aggressively seek to protect your rights and entitlements and will provide you with the professional representation you need to the recognition and compensation you deserve. We will examine your case for free.